Whether it's legal to pass on the right in Maryland depends on the situation. The Maryland law set forth below, and is similar to what many states have, includes the ultimate judgment call: "when it is safe to do so." What is safe and what is insanely dangerous depends on the type of road the driver is on and the situation at hand. Unlike many other states, Maryland does not get into specific parameters of when you can pass on the right. Instead, it demands reasonableness which is a very broad standard. The easy calls are passing on the right on a highway with multiple lanes going in the same direction (which is fine) and passing on the right on a dual lane highway (which is terribly illegal). In the latter case, other drivers have a reasonable expectation that other traffic is going to obey the rules of the road and not be passed on the right. You can also overtake the lead vehicle on the shoulder on a left-hand turn, again if the circumstances make it safe to do so. You need to see what is there to be seen in front of you and make a determination if it is entirely safe. § 21-303. General rules governing overtaking and passing vehicles. (a) In general.- Except as otherwise provided in this subtitle, this section governs the overtaking and passing of vehicles going in the same direction. (b) Overtaking vehicle to pass to the left.- The driver of a vehicle overtaking another vehicle that is going in the same direction shall pass to the left of the overtaken vehicle at a safe distance. (c) Overtaking vehicles going in the same direction.- The driver of a vehicle overtaking another vehicle that is going in the same direction, until safely clear of the overtaken vehicle, may not drive any part of his vehicle directly in front of the overtaken vehicle. (d) Overtaken vehicle to give way to right.- Except when overtaking and passing on the right is permitted, the driver of an overtaken vehicle, on audible signal, shall give way to the right in favor of the overtaking vehicle. (e) Duty of driver of overtaken vehicle.- Except when overtaking and passing on the right is permitted, the driver of an overtaken vehicle, until completely passed by the overtaking vehicle, may not increase the speed of his vehicle. On any one-way roadway, if the roadway is free from obstruction and wide enough for two or more lines of moving vehicles. Safe conditions required. 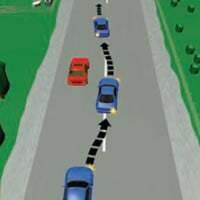 - The driver of a vehicle may not overtake and pass another vehicle to the right only if it is safe to do so. Driving off roadway.- The movement described under subsection (b) of this section may not be made by driving off the roadway. The primary battlefield on this jury instruction is section 21-304(b) regarding what constitutes “safe to do so.” We recently addressed this issue in an appellate brief in Baltimore City Circuit Court. Ultimately, this is something of an eye of the beholder jury instruction. It does not perscribe clear instructions to drivers in specific situations. There is often dispute about passing on the right using part or all of the road's shoulder. This law and the jury instruction that comes with it does not provide clear answers, leaving it to the jury to decide what is reasonable. Worried about how many points you will actually get on your license? Learn about how that process works. Looking for a personal injury lawyer that has a history of getting results? Call 800-553-8082 or get a free online consultation.